Mirror Lake Scenic Byway cuts through Utah’s highest mountain range from the town of Kamas up into the national forest before descending to placid Mirror Lake, located 16 miles east of Park City. Mirror Lake Highway begins 16 miles east of Park City on UT Highway 150. The drive is approximately 65 miles long. Plan on 2 – 3 hours for driving. Visit Upper Provo Falls and fish the Provo River. Camp and recreate in Wasatch-Cache National Forest. Get great views of Mirror Lake. 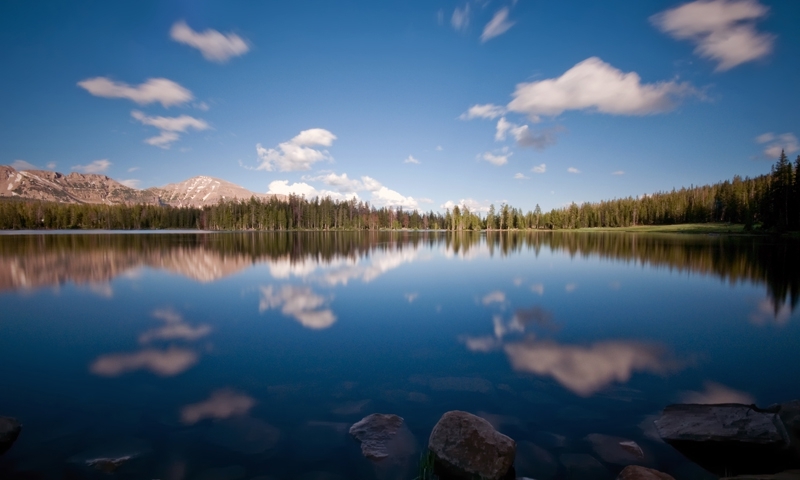 The Mirror Lake Scenic Byway runs for 65 miles east and north, from Kamas, UT to the upper edge of Wasatch-Cache National Forest and the Uinta Range near the Wyoming/Utah border. Featured along this breathtaking stretch is your chance to see alpine peaks, pine forests, rivers, waterfalls, and lakes all inside of a few hours. Pause for minutes, hours or days in or around Wasatch-Cache National Forest, Upper Provo River Falls, the Provo River, Bald Mountain Pass, and Mirror Lake. The highway is a seasonal road that may be closed due to weather so best time to visit is from late May through mid-autumn. You can reach Mirror Lake Scenic Byway (UT-150) from Park City by following UT-248 E to Kamas. From Kamas, follow UT-150 E to UT-150 N Scenic and continue. The drive from Park City to Kamas is 16 miles and takes about 25 minutes. Mirror Lake Scenic Byway is 65 miles long and takes about two to three hours to drive. See alpine landscapes dotted with clear lakes, open meadows, rising peaks, and lush pine forests. Stop at one of several pull-outs and picnic areas for a rest, snack and photograph. Check out the terraced shelves and cascading water at Upper Provo River Falls. Trout fish on the Provo River. Stay in a nearby Wasatch-Cache National Forest Campround including Christmas Meadows CG, Stillwater CG, Mirror Lake CG and Picnic Area. Stop at the byway’s highest point at 10,687 on top of Bald Mountain Pass. Explore the incredible surroundings at Mirror Lake.